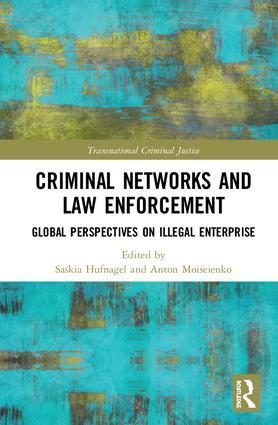 This collection presents an analysis of illicit networks and discusses implications for law enforcement and crime prevention. The contributors draw on a range of methodologies and apply them to diverse international criminological settings, from illegal fishing in the Indo-Pacific to 'money mule’ networks in the Netherlands. Using a variety of examples, the book elucidates how and why criminals form networks of cooperation, and how they can be disrupted. It is expected to be of interest to those who study criminology or criminal law, as well as law enforcement practitioners. Dr Saskia Hufnagel is a Senior Lecturer in Criminal Law and Co-Director of the Criminal Justice Centre (CJC) at Queen Mary University of London. She previously worked as a Research Fellow at the Australian Research Council Centre of Excellence in Policing and Security, Griffith University, Australia, and was a Leverhulme Fellow at the University of Leeds. During the completion of her PhD she taught at the ANU College of Law and between 2009 and 2011 she held a permanent teaching position at the University of Canberra. Anton Moiseienko holds an undergraduate degree in international law from Kiev National University, Ukraine and a Master of Law (LLM) degree from the University of Cambridge. While studying in Kiev, he worked part-time in a Ukrainian commercial law firm for two years. After the graduation from Cambridge, Anton spent two months at several barristers’ chambers in London pursuant to the Inner Temple’s Pegasus Trust Scholarship. He then commenced his PhD at QMUL having received the School of Law’s studentship.